Senator Tom Harkin says former President Bill Clinton needs to "chill out." According to a San Francisco newspaper’s report, Bill Clinton had a "meltdown" during a private meeting with super delegates from California. Harkin says he’s not going to "judge" whether Clinton’s doing his wife’s campaign more harm than good. "I did say before he ought to chill out a little bit and from what I’ve seen, I think he has, but again this recent thing in California, I don’t know," Harkin says. "I’d just as soon not get drawn into that." Harkin contends the ongoing contest between Hillary Clinton and Barack Obama is good for the Democratic Party. "I don’t think this is hurting my party as long as it doesn’t get real personal," Harkin says. 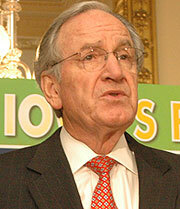 According to Harkin, the two candidates will be fine if they stick to the issues. Harkin’s wife, Ruth, publicly endorsed Hillary Clinton during a rally in Des Moines last summer. During a telephone conference call, a reporter from the Cedar Rapids Gazette asked Harkin whether his wife was trying to exert some influence on him because the senator is one of those "super delegates" who could decide who gets his party’s presidential nomination. "Well, I don’t know if I need to discuss discussions between me and my wife," Harkin replied. Read and hear more about this story on The Blog.